Pick your toppings, press a button, swipe your card and and receive a fresh-baked pizza from an ATM machine in a matter of minutes. While brand new to the United States, this novel device has been around for years in Europe. 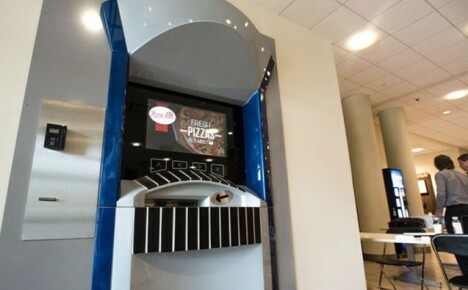 “The Pizza ATM™ is not a prototype, it has history. It is the single most dependable, most profitable, and innovative machine of its kind. It is the fruit of many years of research and continued innovation. It has been successfully operating for 14 years and is providing long lasting reliability.” The machine takes the pizza they select from a refrigerated compartment and lifts it into a convection oven. Naturally, its inventors wanted to put it in the most likely-to-be-used spot when migrating the machine to America, and thus selected a college campus for the first deployment. “Xavier University is winning the hearts of campus pizza lovers with a recent addition to a residence hall. 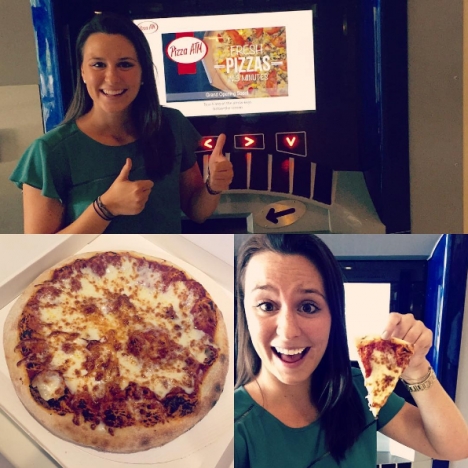 The university put a Pizza ATM in Fenwick Place that serves up a fresh, restaurant-quality pizza in minutes. The bonus: it’s open 24 hours a day, seven days a week.” At $9 a slice this is sure to be a hot commodity, comparable in cost to a delivery pie plus tip (and without the waiting time). See more in Industrial Design or under Technology. August, 2016.